Duplicity and deception: aid from a djinn is a curse under any guise. Betrothed to a cruel lord, Princess Kordahla dreams of fleeing to her decadent neighbour, a journey fraught with danger, and no promise of sanctuary at its end. Her one hope is to offer the southern shah a prize so valuable he cannot refuse to harbour her: the secret of the mahktashaan, the soldier-magicians sworn to protect her father’s court. But the mahktashaan guard their magic with blooded sword, and in stealing one of their powerful crystals she will risk her life. Unless she accepts the help of a treacherous djinn intent on tricking her into a deal. It is a compact which threatens to shatter the fragile peace in the Three Realms. 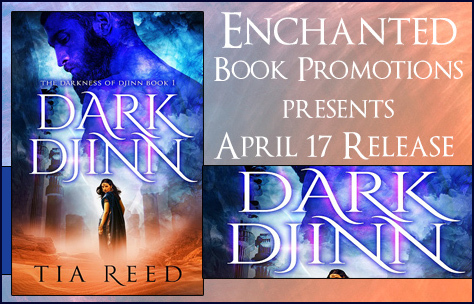 A gripping tale of realms besieged and honour lost, of blood-ties severed and romance dreamed, Dark Djinn begins an epic quest to save mortals from the schemes of djinn. Tia Reed loves nothing better than burying her nose in a story of her own imagining, cuddling her bossy cat and rescuing chewed pillows from her hyperactive dog. She takes every opportunity to do all three when she is not teaching English as a second language. Her other hobbies usually take a back seat but include trying to tame her beast of a garden, hiking and travelling. The latter has thrown her many interesting, sometimes hair-raising experiences, which she loves twisting into stories. She was born in Malta, but lives in Adelaide, Australia.